To claim this profile, please confirm you are Ja'Naia Moran. To follow this profile, please let us know your relationship to Ja'Naia Moran. Ja'Naia's basketball stats have been updated for the loss @ Palm Beach Lakes. RESULTLoss Girls varsity basketball @ Palm Beach Lakes. The Boynton Beach varsity basketball team lost Monday's away playoff game against Palm Beach Lakes (West Palm Beach, FL) by a score of 77-20. 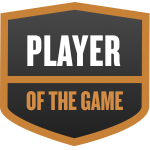 Ja'Naia was selected the Player of the Game in the basketball game against Olympic Heights on Thu, Dec 13 2018. Congratulations to #4 Ja'Naia Moran for being selected the Boynton Beach Girls Basketball Player of the Game. Ja'Naia's basketball stats have been updated for the win vs. Village Academy. RESULTWin Girls varsity basketball vs. Village Academy. The Boynton Beach varsity basketball team won Thursday's home non-conference game against Village Academy (Delray Beach, FL) by a score of 56-37. Ja'Naia's basketball stats have been updated for the loss @ Lake Worth. RESULTLoss Girls varsity basketball @ Lake Worth. The Boynton Beach varsity basketball team lost Tuesday's away non-conference game against Lake Worth (FL) by a score of 35-34. Ja'Naia's basketball stats have been updated for the loss @ Park Vista. RESULTLoss Girls varsity basketball @ Park Vista. The Boynton Beach varsity basketball team lost Monday's away non-conference game against Park Vista (Lake Worth, FL) by a score of 47-25. Ja'Naia's basketball stats have been updated for the loss vs. Dwyer. RESULTLoss Girls varsity basketball vs. Dwyer. The Boynton Beach varsity basketball team lost Friday's home conference game against Dwyer (Palm Beach Gardens, FL) by a score of 47-32. Ja'Naia's basketball stats have been updated for the loss vs. Jupiter. RESULTLoss Girls varsity basketball vs. Jupiter. The Boynton Beach varsity basketball team lost Wednesday's home non-conference game against Jupiter (FL) by a score of 50-17. Ja'Naia's basketball stats have been updated for the loss vs. Forest Hill. RESULTLoss Girls varsity basketball vs. Forest Hill. The Boynton Beach varsity basketball team lost Monday's home conference game against Forest Hill (West Palm Beach, FL) by a score of 52-34. Ja'Naia's basketball stats have been updated for the loss vs. West Boca Raton. RESULTLoss Girls varsity basketball vs. West Boca Raton. The Boynton Beach varsity basketball team lost Thursday's home conference game against West Boca Raton (Boca Raton, FL) by a score of 78-36. Ja'Naia's basketball stats have been updated for the loss vs. Seminole Ridge. RESULTLoss Girls varsity basketball vs. Seminole Ridge. The Boynton Beach varsity basketball team lost Tuesday's home non-conference game against Seminole Ridge (Loxahatchee, FL) by a score of 63-26.